The PEXSAT31E1 2-Port PCI Express SATA/eSATA 6 Gbps (SATA 3.0) Controller Card adds one internal SATA 3.0 (6 Gbps) and one external eSATA 3.0 (6 Gbps) port, through a single PCIe slot. 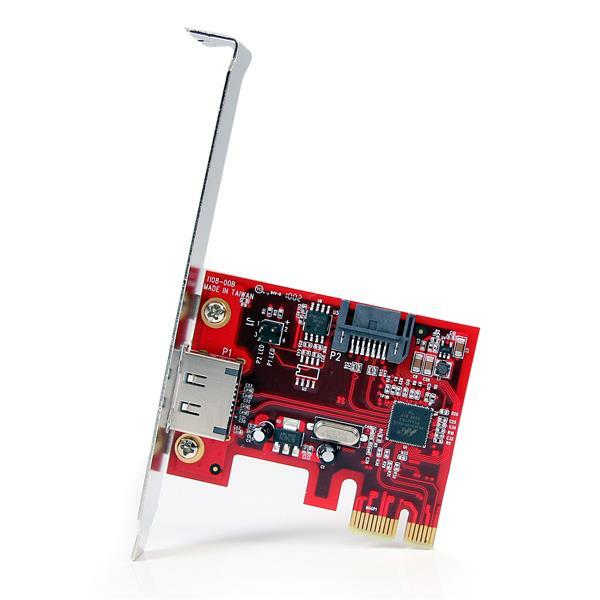 Providing simple connectivity between a host computer and SATA 3.0 internal and external devices, the PCIe SATA/eSATA 3.0 adapter/controller card offers a cost-effective solution for connecting high-speed storage, such as High RPM Hard Drives , Solid State Drives (SSD), and external storage arrays, which in turn allows for easier data backups and archiving. Suitable for installation in slimline or small form factor computer cases, the PEXSAT31E1 offers a dual profile solution, including a low profile/half-height bracket for easy installation. Only one port can use the Port Multiplier feature at a time. Alarm function is not supported in MSU software. A space-saving, latching right angle SATA hard drive cable, for installations in tight spaces. This device supports the ATA Packet Interface (ATAPI) protocol. ATAPI is required for optical drives, including CD-ROM drives, DVD-ROM drives, and Blu-ray players. Because this device supports ATAPI, optical drives are also supported. In the list of extracted files, right-click the Setup.exe file and click Run as Administrator. 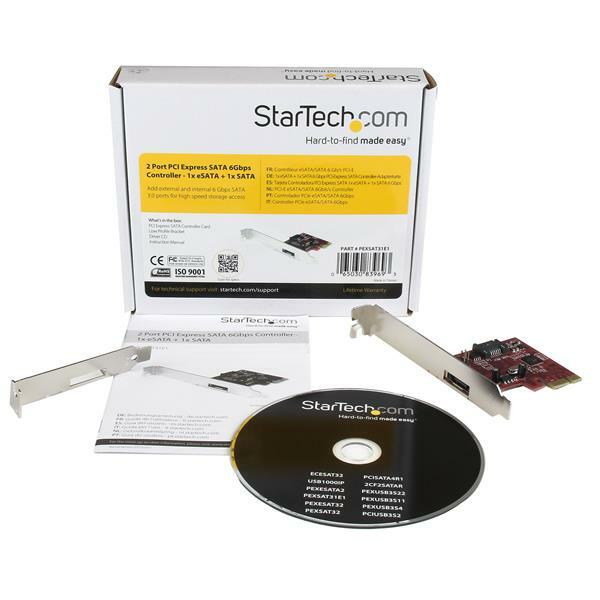 I want to move the hard drive with my operating system installed to my StarTech.com hard drive controller. What do I do? Note: Not all hard drive controller cards have drivers that allow you to install the operating system onto the hard drive. All of the hard drive controllers that display this FAQ include this capability. Before you begin, consult the documentation that came with the motherboard to make sure that the motherboard or BIOS supports booting from an expansion card. Back up any data on the hard drive. Make a copy of the drivers from the website onto a floppy disc, CD, DVD, or USB flash drive. The drivers that you download depends on the operating system that you want to install. Install the hard drive controller card onto your motherboard. Plug the hard drive into the controller card. Turn on your computer and open the operating system install wizard. Before you select the hard drive that you want to install the operating system onto, select the option to install third-party drivers. Point the driver installer to the floppy disc, CD, DVD, or USB flash drive. 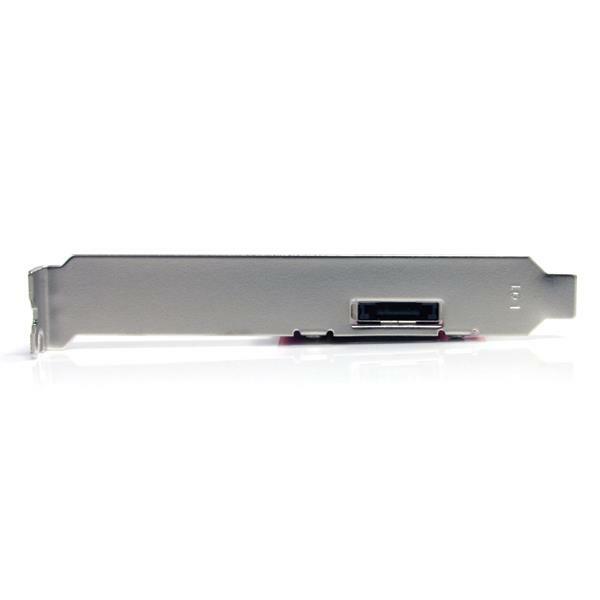 Select the hard drive on the hard drive controller card as the location where you want to install the operating system. Complete the on-screen instructions to finish installing the operating system. Use the IDE, SATA, or eSATA cable, hard drive, and hard drive controller card in another setup to see if the problem is with the components or the setup. Use a different IDE, SATA, or eSATA cable, hard drive, and hard drive controller card in your setup to see if the problem persists. Ideally, you should test a component that you know works in another setup. To open the Device Manager, press the Windows key + R, type devmgmt.msc, and press Enter. Check the IDE ATA/ATAPI controllers (for IDE) section, or the Storage controllers (for SATA) section. If you do not see the hard drive controller card in Device Manager, refer to the following FAQ: https://www.startech.com/support/faqs/technical-support?topic=expansion-cards#pci-pcie-cannot-boot-os-or-detect-windows. If the device is listed with an error, reinstall the drivers by completing the instructions on the website. If the hard drive is listed with unallocated space, the hard drive needs to be formatted. Right-click unallocated and click New Simple Volume. Follow the on-screen instructions to complete the reformatting. Note: A formatted hard drive does not show up in Computer or My Computer until it has a drive letter assigned to it.